kar.li boutique .:. 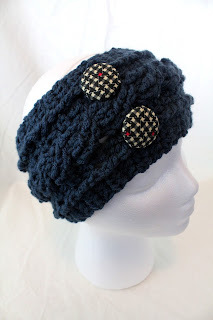 a shopaholic crocheter: Navy Blue Headband - custom order! I received a custom order to transform one of my previously listed cable headbands into an ultimate adorable accessory. She wanted a navy blue band, which I was glad to have on hand. It took me a while to remember what hook size I used but I ended up using a J hook and triple crochet cables to generate the chunky braided cable look. I also make fabric covered buttons so my customer requested a couple of those to go onto her headband. Along with the crochet cable work, this headband turned out really cute! I think we will see more of this fabric covered button + cable headband combo in the near future. I'm really happy with how it turned out.